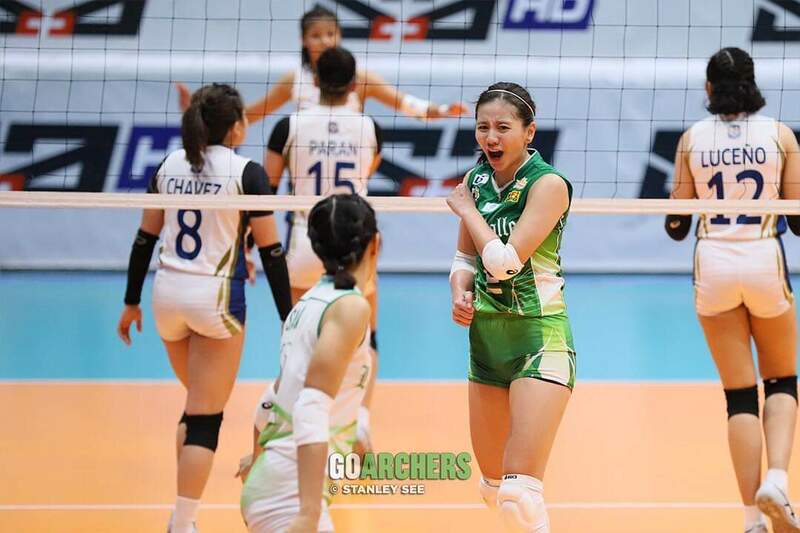 Behind a season-high 17 points by Des Cheng, the Lady Spikers rebound from their sorry performance last Sunday with a straight set victory over NU 25-20, 25-18, 25-10. Most of Cheng’s points came off 14 attacks including 2 service aces. Tin Tiamzon finished with 11 markers while Lourdes Clemente had 9. From a high 37 errors in their last match versus UP, the defending champs executed much better this time around. They committed 10 miscues as compared to 24 by the young Lady Bulldogs. “Iba yung galaw namin ngayon e. Sabi po ni coach Ramil unlike noong last na game namin. Lagi namang pinapaalala ni Coach na tiwala sa sarili, tapos syempre na La Salle ka e, wala namang La Salle na duwag. So ayun, lagi naman niyang pinapaalala siguro nadala naming iyon (ngayon)”, said rookie Jolina Dela Cruz who only tallied 7 points in this match but made key contributions on defense. Convincing this victory may be, the real test for the Lady Spikers will come this Sunday against UST. Both teams are currently tied for 2nd at 6-3. "Wala namang La Salle na duwag."